Don Elgin is probably best known as being a triple Paralympian competing in the Pentathlon at the 1996 Atlanta, 2000 Sydney and 2004 Athens Paralympic Games as well as numerous media engagements. But little did people know that Don spent the early part of his career working in a contact centre! Since retiring from elite sport, Don is a professional motivational speaker and coach performing across the world as well as facilitating leadership training and motivational keynote sessions for a vast array of local organisations including BHP, Telstra, Australia Post, NAB, Australian Sports Physicians, Victorian Police Force, the Education sector, many not for profits and multiple sporting teams including Hawthorn FC and Western Bulldogs FC in the AFL. Don is passionate about taking his life experience and many years of working in high-performance teams from the sporting arena to the corporate world to help people achieve a higher level of performance. 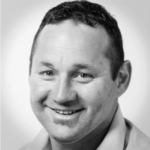 Continuing to hone his leadership skills, he spent time working with Leading Teams and has recently founded his own leadership consultancy, Star Leadership as well as being an internationally accredited facilitator with the World Academy of Sport. “As a competitor, I was driven to be the best athlete in the world, I now work with organisations all over the world facilitating the Star Leadership program helping them in their pursuit to be the world’s best in their chosen field. The exciting thing about being in pursuit of excellence is the need to be constantly open to learning and challenging yourself, the best leaders know this and the best teams in the world do this”. Don has specifically designed a leadership and coaching course specifically for contact centre leaders and combined with his general excitement for life (he gets excited by oxygen as he puts it!) the sessions will be packed full of great tips and humour.